When most 9 year-olds are racing home after school to play outside with their friends, Mikaila Ulmer is negotiating contracts with national natural food retail stores. The young entrepreneur is the creator of BeeSweet Lemonade—a tasty, natural lemonade drink inspired by her great grandmother Helen’s recipe and a love for honeybees. For each bottle purchased, Mikaila donates 20 percent of the profits to organizations fighting to save the honeybees. Now a veteran of the business (she started the company when she was just 4 years of age! ), Mikaila is well on her way to leading a new generation of socially conscious tots in the way of conservation. Even more refreshing than Mikaila’s story are the products themselves. Sourced locally from Austin-area farmers, each drink is an amalgamation of natural ingredients that include: pure filtered water, fresh squeezed lemon juice, honey, cane sugar, organic flaxseed and local organic mint. Sold at Whole Foods and surrounding health food stores in her hometown of Austin, Texas, “Buy a bottle, save a bee” is the promise that buzzes in customers’ ears when they purchase BeeSweet products. The teeny CEO doesn’t plan to rest on her laurels anytime in the future. She’s got big vision for BeeSweet’s success with plans to add new flavors to the line, open a store and potentially add an apparel line. That’s after she’s completed her homework, of course. When most 9 year-olds are racing home after school to play outside with their friends, Mikaila Ulmer is negotiating contracts with national natural food retail stores. 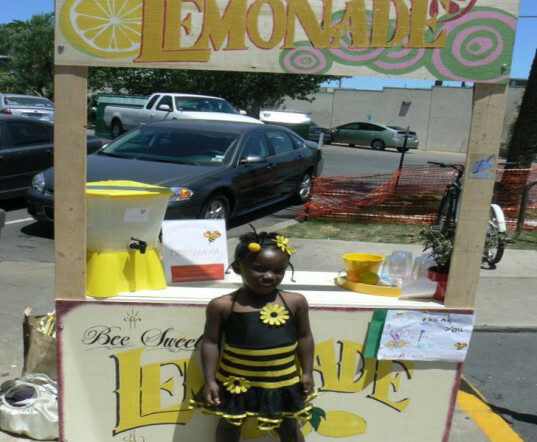 The young entrepreneur is the creator of BeeSweet Lemonade�a tasty, natural lemonade drink inspired by her great grandmother Helen�s recipe and a love for honeybees. For each bottle purchased, Mikaila donates 20 percent of the profits to organizations fighting to save the honeybees. Now a veteran of the business (she started the company when she was just 4 years of age! ), Mikaila is well on her way to leading a new generation of socially conscious tots in the way of conservation.